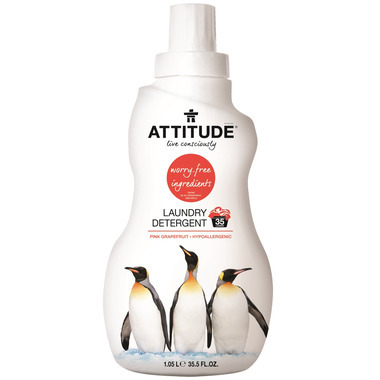 Liven up your laundry routine with ATTITUDE's pink grapefruit scented Laundry Detergent! Made of natural and safe ingredients, this laundry detergent is hypoallergenic and offers a safe and effective clean that is gentle on clothing. Plus, ATTITUDE's Laundry Detergent will keep your family's skin free of irritating enzymes. ATTITUDE promises to use only the safest and purest ingredients. 35 loads. Love the uplifting scent, and seems to do a great job. Makes me feel good for not putting toxic stuff down the pipes. This laundry soap not only works very well, it smells fantastic! I also love that it's EWG verified! My absolute favourite! Washes really well amidst the hard water here in Alberta. Great that it is a clean product and safe for the environment. Love this product! Works great; smells nice and rates well on EWG for being safe to use and for the environment.